Game translators are the clever folks that help game developers reach a broader audience and gamers from all over the world enjoy games in their native language. The video games market has become truly global and the demand for game translation services is growing proportionally and with it the interest in game localization careers. Several gamers willing to turn their passion into a living have reached out to us asking for tips on how to become a game translator. In this article, we will detail the skills and tools you need to get into this peculiar, sometimes unappreciated, overly criticized, but also incredibly creative and exciting job that is game localization. What do game translators actually do? Game translators convert a game's story, its characters, the dialogue and basically everything in the game world from one language to another. They also localize the marketing content that comes with them, such as websites, marketplace descriptions and even the packaging text. This goes beyond mere translation and it would be more accurate to say that a game translator rewrites the game. A game localization professional can build a whole world or write catchy marketing content in another language and that's the level of skill you'll need to achieve to get ahead in this competitive field. 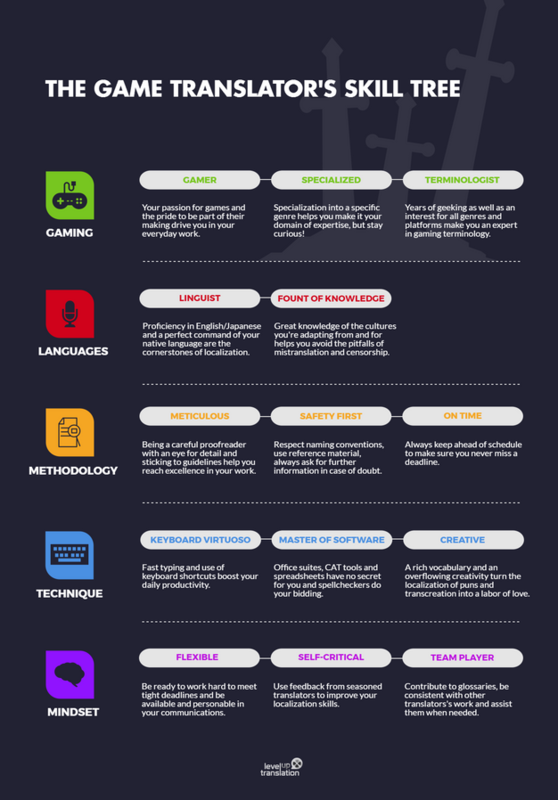 What's in a game translator's skill tree? Professional game translators are at the very least bilingual. Knowing more languages will also help, especially if they are from the same “family". But speaking two languages doesn't make you a localization specialist any more than having two hands makes you a pianist. You need to be truly fluent in the language(s) you want to translate from and also have a perfect command of your own native language. A common skill to all translators is broad general knowledge. Games are getting more and more mature and the themes they deal with are sometimes highly sophisticated. Feeding your brain a daily dose of idioms, history, politics (sometimes a very hot topic in video games) and pop culture in several languages is therefore a healthy habit, even for a game translator. In fact, you should have a deep knowledge of the countries you want to localize games from and for. Obviously, you'll also need to love and have played video games. Lots of them, and not just one type (not all games are medieval-fantasy RPGs or sports games). Having a preference and a favourite genre can help you make it your speciality. If you know what PBOE, DoT, or IAP means and can translate these acronyms to your language, you're on the right track (if not, you can check it here). Take the time to read what game studios or localization companies are looking for from their games translators and you'll find that a love of games is high on the list. But they're not looking for casual gamers. Developers and good game localization agencies are seeking kindred spirits. They'll want to know what your first console was and which games you played so much you would go to sleep dreaming about them. If your passion is their passion, the rapport you'll need to build will come much easier. Finding time to play may become more difficult though, but keeping up to date with the latest releases, technology and any new terminology from the industry is also part of your job. But you love games, right? To be successful in the game translation business, you need a very well-oiled methodology. Sorry to kill your dreams, but game translators just don't play all day. In fact, we barely see the games we localize and that is the the main challenge of our heroic daily lives: dealing with the lack of context. Not failing the localization quest in such conditions requires some proper organization. Unlike Level Up Translation, not all localization companies take the time (should we say “make the effort”?) to ask game developers to provide reference material to help translators understand their game and contextualize things. This is where your work can get tricky. "Embarrassing mistranslations happen 9 out of 10 times because of a lack of context. So ask, ask and ask again!" If you work for these companies, you will often be clueless about the meaning of certain strings. You'll have to solely rely on a Q&A file where you and other translators log your queries for the studio. What comes next is a mixture of luck and ethics, since unfortunately not all game studios are aware or indeed informed that such information is vital for the proper localization of their games. You will sometimes return empty-handed and get frustrated at the lack of information you've been given. Regardless, you should always try to get as much information from the developers as possible. Embarrassing mistranslations happen 9 out of 10 times because of a lack of context. So ask, ask and ask again! Research is also at the heart of a localization job. There are dozens of online tools available to help you. Apps and sites like WordReference, Linguee, Wikipedia, Wikis, etc can all be lifelines, but always cross-reference your information. With time and practice, you'll build a powerful arsenal that will allow you to quickly find out what that word or idiom means. "Always aim for excellence and consistency. Kill all typos and double empty spaces must die!" Great attention to detail is compulsory in a game translator's skill tree. A thorough proofreading of your work after letting it sit for a day completed with a careful spell check make all the difference between an average and a great translation. Always aim for excellence and consistency. Kill all typos and double empty spaces must die! Check for homophones and make sure you've set the correct language in your spell checker. Follow your client's guidelines and style-guide. If they say character X is usually addressed in an informal way, then your translation has to follow suit. Don't mess with character restrictions either. Despite all their efforts and scalable UI elements, developers sometimes have no choice but to limit the length of the text. Any character beyond the limit will either overflow or be cut-off. Character restrictions are common on portable devices and even more for Nintendo's 3DS, so stick to them. "Always try to keep ahead of schedule." Last but not least, deadlines are not called like that for nothing. If you ever deliver passed one, consider yourself dead to your client. Always try to keep ahead of schedule even if only a little. It's a good way to defend against issues like down time, no Internet connection, or maintenance from the translation tool you're using. Early deliveries will also score you points with project managers. Happy project managers mean more projects for you and potentially for your firm too. Let's face it we all love fist bumps and high fives. Disciplinaries... not so much. For reference, the "standard" hourly rate for a translator is around 300 words/h. For a basic localization project, an experienced game translator will be expected to work nearly twice as fast. Having your office suite or CAT tool at your fingertips will definitely help. As a translator, “transcreation” is a word that you'll either love or hate. Usually for a game translator, this is where the real fun begins. Transcreation is the art of localizing vocabulary created especially for a game. Not all games require transcreation, but most of them do. Having a rich vocabulary and overflowing creativity will help you transcend your mere job. CREATING WORDS! The coolest job ever. Character restrictions can also stifle your creativity, when it comes to making a translation fit into a small number of characters yet keeping it intelligible. It's much harder than you think! More often than not translators work in team. This is especially true for massive projects such as MMOs. This can mean debates on how to translate names and locations. Another important point of such projects is the management of term bases. These are the glossaries that are directly available from within CAT tools. When localizing a term, it is good practice for a translator to add it to the term base so that other translators can find it quickly and keep consistency. Team players contribute to build up the glossary of the game and try to help their fellow game translators when they ask for help. Your work as a translator will also be proofread by someone else. Often someone who's more experienced than you. Corrections can sometimes be hard to accept and it's easy to get frustrated. Keep calm, accept critique and use the feedback to improve your work. Deadlines again... Being a freelance game translator requires flexibility. Work comes when you're not expecting it and you often have to work weekends or over 10 hours a day. To stand out from the endless pool of translators some companies have, don't just be the average bear. Make an effort to be personable in your communications. Don't just write stuff like “I'm available” when offered a job, or “Sorry. Too busy” when turning it down. Report that typo from the source language, even if it's minor, the client will appreciate you taking the time and effort. Can you master all these skills? So what's the best way in? The most relevant qualifications to game translation are languages (with a focus on translation). Game design or promotion from localization tester are also great ways to become a game translator. - Find an entry level position with a game developer or a localization testing company and climb the ladder from within. Because it's an industry in its youth, there are very few full-time courses and none dedicated wholly to game localization. That said, the gaming industry is not known for hanging around and new courses, webinars and internships are popping up faster than we can count them. You don't even need to wait for anyone. A great way to get started is to do it yourself. Find an indie game you love and offer to translate it yourself. You can also try your skills at LocJAM, a game translation contest open to both professionals and amateurs. The competition is sponsored by some major localization companies and offers great hands-on experience, even if you don't win the contest. If you're confident in your skills, you can send an application to a localization agency and take their test. Some may provide you some feedback if you fail (although you may have to ask for it). Feedback like this will help you improve, and if you pass the test, well, that will be your first client! The faster you understand what game translation requires, the quicker you'll be able to do it. Many people in the field earned their stars by playing games in other languages. Play games in a different language, or better yet play them in two at once by choosing one language for dialogue and another for subtitles. This is a great way to get your head around cultural difference, untranslatable idioms and will help you pick up tips and tricks. In the same way, watching movies, reading books and comics can help you build your vocabulary and help you get a handle on sentence structure. This advice will become more relevant once you start working as a game translator because you'll be able to focus your research in a more practical direction. Clearly studying media related to WWII or fire weapons would help massively if the game you're working on has a similar theme. Learning how to use the appropriate software is also important. We go into this in more detail at the end of this article in the interview section, but a good grasp of most office suites is essential. It's possible to work either as a freelancer or as part of an in-house localization team. There are benefits and cons to both. It really depends on the kind of person you are. If you value your freedom, like to work (or not work) as much as you want, have self-discipline and you're not worried about where your next pint of beer is coming from, then by all means freelance. Working as a freelancer also means no commuting, but also less socialization. However, if you like a bit of stability in your life, enjoy the office life and you're not afraid of the 9 to 5 grind, then work in house. Either way, you'll work with some very cool and passionate people from all over the world! DO – Research the companies you're applying for. You should know what games they have released and what they have coming up. DON'T – Focus on dissing a game, point out all the flaws and explain how you could have done it better. Keep your message up-beat and positive. In short, no one likes a know-it-all, even less without references. DO – Read walk-throughs and game wikis in various languages. The ability to spot the subtle nuances in the game variations is half the art of game localization and translation. DON'T – Don't give up! The video games market is huge and growing all the time. Just because you get knocked down doesn't mean you won't succeed. Stick another coin in the slot and hit Continue. DO – Take as many free courses and join in as many webinars as you can. All experience is good experience and it all adds up. Game translation is an ongoing learning process, so stay curious and passionate. DON'T – Treat game localization lightly. It's a fun but serious and evolving industry. If you're focused and you want to get ahead, you can have a career helping gamers all over the globe enjoy new worlds, have new experiences and even learn new skills. Layra, an aspiring Japanese to English game translator from Canada reached out to us and inspired us this article. My first question would be what CAT tools or other software should a video game translator master? Being able to use a suite like Microsoft Office or Open Office is a must. You need to be able to search/replace, spell check, insert unbreakable spaces, etc. Excel sheets (.xml, .xlsx) and Notepad files are the most common formats a game translator deals with and they have to be comfortable working with these. As a freelancer, you also work with several CAT tools as every agency has their favorite. They will usually have their own accounts, so you won't need to buy the most popular (and expensive) software like Trados and MemoQ. At Level Up Translation we work with Memsource and SmartCAT. We used to work with MemoQ, but even though it's very powerful and has more functions, it got very heavy over the years. Occasionally Memsource is very lightweight in desktop edition and very fast online. Memsource and SmartCAT are also great for freelancers because they offer free plans. What are the most common languages to translate? FIGS used to be the norm until a couple of years ago, but the Italian market is not really what it used to be and markets like Brazil and China are growing really fast. Right now we're shifting more towards French, German, Spanish, Russian, Brazilian Portuguese and Chinese (simplified). In the end, it depends on the type of game and platform and it's up to the developer or publisher to find out where their game would do well. Most games are developed in English or Japanese, so if you master these languages plus another from the list above, you're off to a good start. What are the main problems I’ll encounter when translating video games? The main problem will be the lack of context (maybe not so much for English though). A simple word like "Play" can have nearly a hundred different translations in Polish depending on the context. The handling of variables, concatenated sentences and character restrictions can also give you headaches. Plural, gender and other such parameters may be missing in the source language. Therefore, you need to ask developers for further information in order to translate accurately. We always ask our partners to provide us as much reference material as possible and usually work with online spreadsheets where our team logs their queries and the studio answers them on the fly. Lastly, do you have any tips for an aspiring video game translator? Apply everywhere you can, there are literally hundreds of localization agencies that open and close everyday. You can even offer your services for free to indie devs with no budget at all if you want to build yourself a portfolio. Never forget why you're doing this job and how lucky you are to be part of this fantastic industry. It's still really young, so there is a lot of room for improvement. It can be quite frustrating at times, but it's also pretty rewarding (seeing your name in the credits never gets old!) and there are some great people to meet and work with. As you can see, game localization requires many skills. It's an art too often associated with censorship though. The main reason behind this is because it's sometimes taken too lightly, by either game studios or even translators themselves. Impossible deadlines, lack of methodology and context, and even low rates can also account for bad translations. With experience and dedication though, you will be able to avoid these pitfalls. You won't become a superstar, game translators work in the shadows behind the scenes, but the satisfaction for being part of the video game making process and the great encounters you will have in the industry are incredibly rewarding. Note: Dear game translation padawans. We feel the Force in strong with you and we hope this post has not led you astray. We wish you all the best in your career. We'd like to end by saying that our small localization team is complete at the moment and we only work with experienced game translators. If you like what you just read, check our blog for more game localization best practices and tips.